Every bride has a dream of fairytale. The soft pink wedding dress, the church that is overspreaded with petals of roses, the bowknots and everything in the shape of heart make up the most romantic and dreamlike fantasy that a bride will have about her own wedding. So come on beautiful brides, forget all the old rules of a traditional wedding. Make your own wedding pink and naïve. 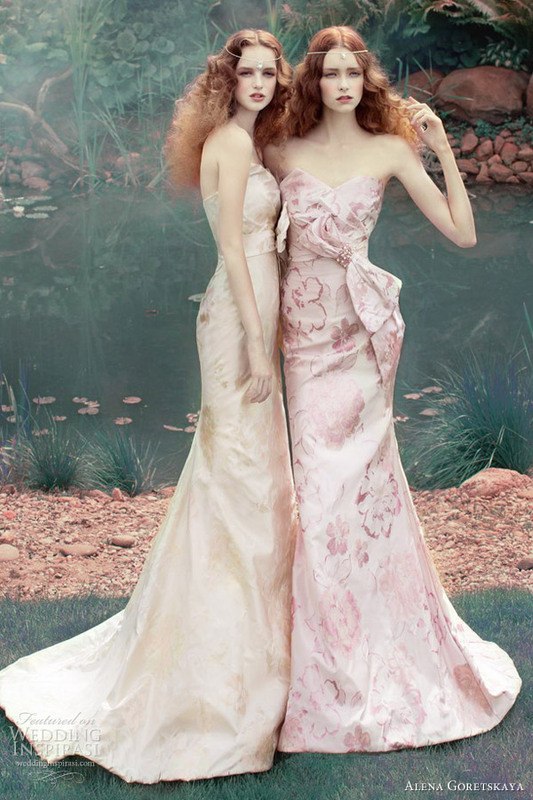 Choose your dreamlike pink wedding dress and be a Barbie bride in the most important day. The colorful flowers and green trees make spring full of youth and the sweet smell. To make a spring wedding more colorful, a pink wedding dress will always be the best choice. Using silvery to match the pink will make the dress more charming. Let’s show the classic in a modern way. First of all, choose the right pink wedding dress. One of the most famous designers Alena Goretskaya launched her new “princess” series of wedding dresses which are most romantic and soft. This series is extremely aristocratic. The use of multi-layer folds and the stacking element in the shape of wedding cake make this new series elegant and luxury. It makes you feel like being in the wonderland. The delicate embroideries and strings of beads around the neckband and the high-waisted multi-layer bowknots make the pure pink wedding dresses which are made in silk give off the elegant and missish light. As the famous designers want to follow the retro fashion trend today, it becomes a compulsory course for every designer who has a sensitive sense of fashion to create an elegant look for the noble by resurrecting the retro styles of wedding dresses. Of course, retro doesn’t mean hidebound and conservative. There are two exaggerated pockets which are designed on the wedding dress that bring lively and delightful to this unique wedding dress. As pink is the symbol of happiness, it becomes the indispensable color for brides. Are you ready to choose a pink jewel for your wedding to make you more glorious? Pink earrings always give people elegant feelings. Choose pink diamonds to be the petals of a rose and purple diamonds to be the stamen. This pair of earrings can bring the elegant and noble feelings to people. Pink earrings are suitable for the European-style wedding dresses as they can show the florid temperament of the bride. A pink necklace can also be a good choice. Choose round diamonds in the colors of different kinds of pink and arrange them carefully into a beautiful pink flower. The sweet necklace will surely make the pink bride more melting. People always think that red and white make the bride look more mature. But why is every bride had to be so mature? I’m young and I’m proud of that. Just despite those old rules. Make the big day pinky and romantic, I’m the most attractive Barbie bride in my pink wedding.